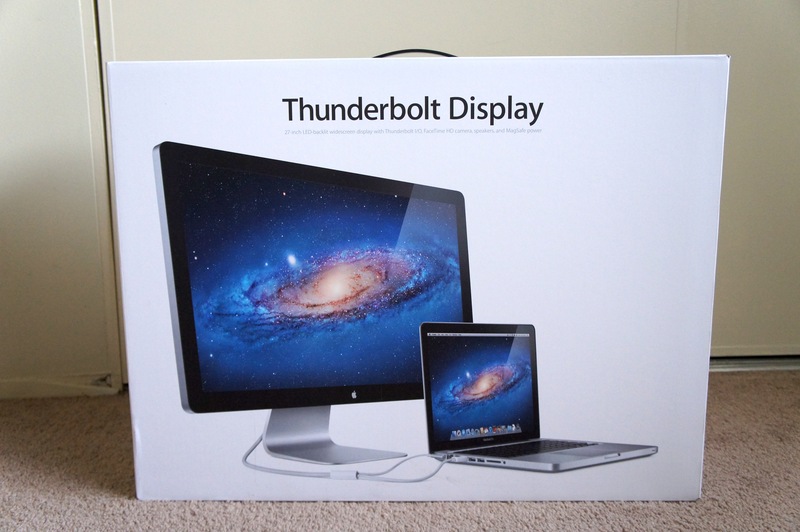 I’ve been eying the Apple Thunderbolt Display for quite some time and have always played with these at the Apple Store or at Best Buy every chance I can get. I love how sharp the display looks and the included features of adding 3 USB, Thunderbolt, FireWire and charge cable for laptops makes this a great docking solution. Also the HD Facetime Camera and built in 2.1 stereo speakers on the display is a plus too. As I’ve been doing more work and taking on several projects at once, my trusty HP w2207 22″ screen wasn’t sufficient enough anymore which is why I decided to upgrade my display. 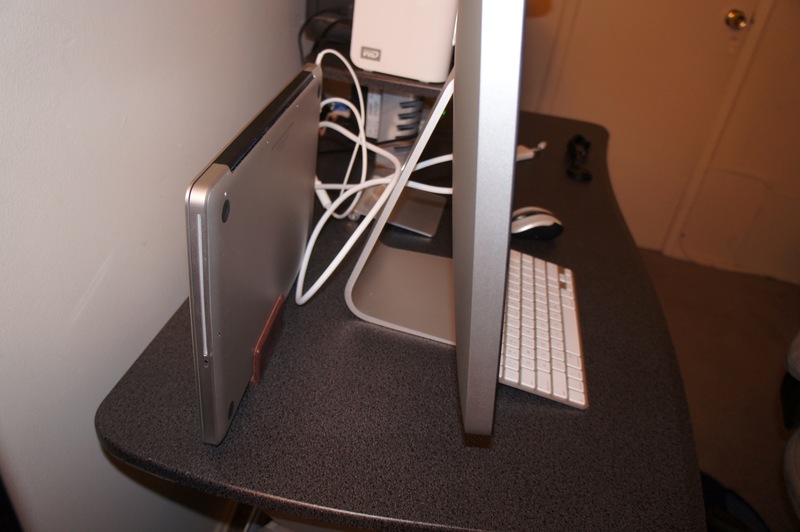 Setting up the Thunderbolt Display was quite easy. All I needed to do was plug in the Thunderbolt port, plug in the power, and I was all set to go with my MacBook Pro 15″ 2011. I know that picture above looks messy but it really is just two cables! My MacBook Pro is being held up with a leather business card holder that I got from Office Depot a few years ago for $3 (much more cost effective than a $50 Book Arc)! I am loving the monitor! Text and images are really sharp, video looks incredible especially the ones in 1080 resolution, and my 16MP photos look fantastic thanks to the 2560 x 1440 resolution. The sound quality is quite impressive for speakers that are built into the monitor. I like the fact that there are no additional cables to plug in for the camera and speakers that are on the screen. It’s very well designed and although it costs $999 in the Apple Store, it’s very well worth it and will pay for itself in the long run with all the included ports and features. 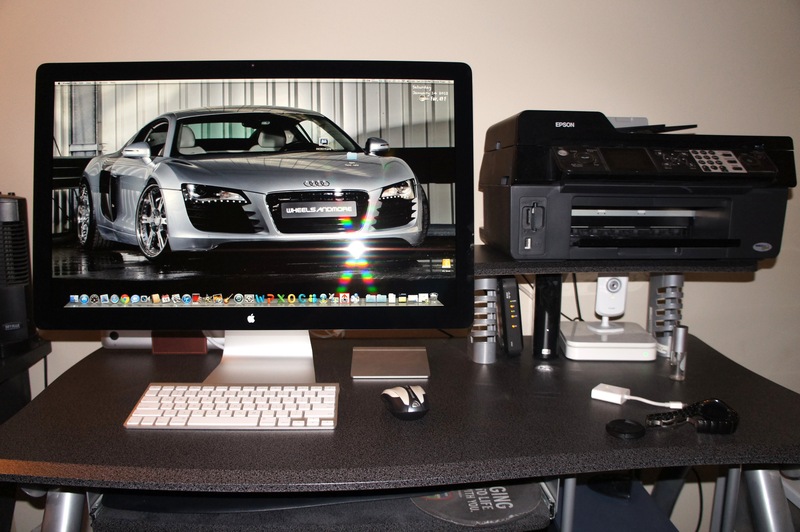 In this case, bigger is definitely better and you can get a lot of work done on a 27 inch screen! I am using the same laptop right now and I am really amazed to see the speed of this gadget. The compact design of this laptop is the best thing that I like about this gadget.